Reuben K. Chen is the founder, CEO, and President of Wellspring Consulting. He has over 25 years of experience in integrated financial planning, asset management, retirement and estate planning (specializing in multi-generation estate planning issues), tax reduction strategies, insurance strategy as well as banking and mortgage lending. As the chief wealth strategist, Reuben’s clients include high net worth retirees, professionals, small business owners, corporate executives and non-profit institutions. His philosophy is to maintain a well-balanced life and extends that belief in helping individuals realize their dreams, incorporating life coaching with proactive financial planning. 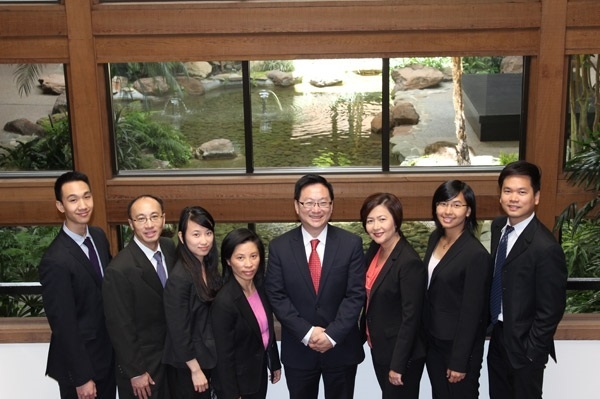 Prior to forming his firm Wellspring Consulting, Reuben was with the Sagemark/Lincoln Financial Advisor for 14 years and oversaw their Milpitas office for 3 years. Howard oversees the tax service division at our firm. He has over 20 years of experience in public accounting and working with corporations, partnerships and high net worth individuals in the San Francisco Bay Area. He specializes in serving the tax and business planning needs of closely held companies, partnerships and their shareholders/partners including tax filing requirements, amended returns and carry back claims, sales, payroll, property tax return filings, and IRS and state tax authority income tax audits. Kelly has over 15 years of financial service experience. He brings to our firm a versatile foundation of knowledge, experience and qualification in equity markets, fixed income markets and operational management. Before joining Wellspring Consulting, Kelly worked at Nabisco Foods Group as a territory manger and Quick and Reilly, a NYSE member firm. During this time at Quick and Reilly, he assisted clients in employee stock option exercise, restricted stock, stock reorganization, trade processing operations and investment management. Kelly holds a Bachelors degree from California State University at Sacramento in Business Finance. Vijay has over 10 years of financial services experience. He worked at TD Ameritrade as an Investment Consultant for over 9 years. He has experience with a risk management approach involving equity options and portfolio construction. While at TD Ameritrade, he earned the $10M Dollar Club Award after acquiring $10M of assets under management during Q4 2006. Later in Q4 2007, became a member of TD Ameritrade's President Club which he earned by enrolling high net worth clients to money managers. Miriam has over 17 years of financial, insurance, marketing and banking experience. Prior to joining Wellspring Consulting, she worked at Hong Kong Hang Seng Bank for 10 years in the Insurance and Private Banking Departments. There she was responsible for marketing and client relation for high net worth clients. Marcus earned his MA degree in investment management from St. John’s University in New York and is now a member of the Wellspring Consulting investment team. He focuses on financial research and analyzes various investment vehicles such as stocks, bonds, mutual funds, variable annuities, alternative investments, as well as, separate managed accounts. He also organizes investment training conferences and client seminars to make sure the financial planning team and clients are updated with the most current program changes and economy trends. In addition, Marcus works with the chief wealth strategist to generate investment portfolio proposals, and to monitor the Wellspring Portfolio and the Wellspring SIN Fund. He also collaborates with the chief wealth strategist to develop investment strategies by analyzing current financial conditions in relation to clients’ future needs and risk tolerance. Marcus’s further role includes quarterly and annual performance reviews for clients. He is fluent in English and Mandarin. Dennis currently oversees the corporate benefits division alongside the chief wealth strategist, manages and process client requests in collaboration with the financial planning division, and seeks new business development opportunities under the guidance of the CEO. Within the corporate benefit division, Dennis works closely with the chief wealth strategist, investment provider/consultant, and third-party plan administrators (TPA) to install new company sponsored retirement plans, review plan provisions, and provide account maintenance support to meet the operational goals the company sponsored retirement plan seeks to accomplish. Dennis earned his Bachelor’s of Science degree in Financial Economics and Quantitative Management from University of California, Riverside. He is fluent in English, and intermediate in Cantonese and Mandarin. Annie has over 24 years of financial services experience, including 6 years in mortgage underwriting. Annie managed and trained operations staff to assist top level executives to grow their business gaining broad financial service experience at various large financial institutions. She applies business acumen in the areas of business processing, client support, accounting, and human resources at Wellspring Consulting. Annie earned her Bachelor’s of Science in Finance from California State University of Hayward [East Bay]. She is fluent in English, Cantonese and Mandarin. Alan oversees the division for all new business processing. The processing role includes new business applications and tracking, underwriting activities concurrently with the insurance division, and monitoring and analyzing reports for Wellspring Consulting financial activities. Alan has over 10 years of financial reporting and customer services experience. Prior to joining Wellspring Consulting, he worked at MCI/WorldCom and Chinchiolo Stemilt California, LLC where he prepared and analyzed multimillion-dollar revenue reports for the company executives. Alan is fluent in English, Cantonese and Mandarin.